Eduard from the Czech Republic is easily the most prolific producer of aftermarket details. Period. Their series of photo-etched detail sets have brought additional fidelity to otherwise bland subjects, and have taken even the best-produced models and kicked them up a notch or two with details that cannot be produced with injection-molded plastic. 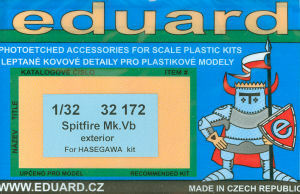 This release tackles the exterior of the venerable Hasegawa 1/32 Spitfire Mk.Vb kit. This set focuses on two areas of the aircraft exterior - the wheel wells and the radiators. The set provides a skirt for the inside of the wheel wells as well as an interior plate for each well. This will keep you from seeing up into the bare wing interior with the gear down. Both radiators also receive new grilles and updates to likewise enhance the appearance when peeking inside the ducts. This set also provides the mounting plate for the antenna mast aft of the cockpit, as well as the mounting plate for the long wire antenna for the top of the vertical stabilizer. The detail set is rounded out with a new gas filler cap for the nose tank as well as a new rear view mirror for the canopy bow. 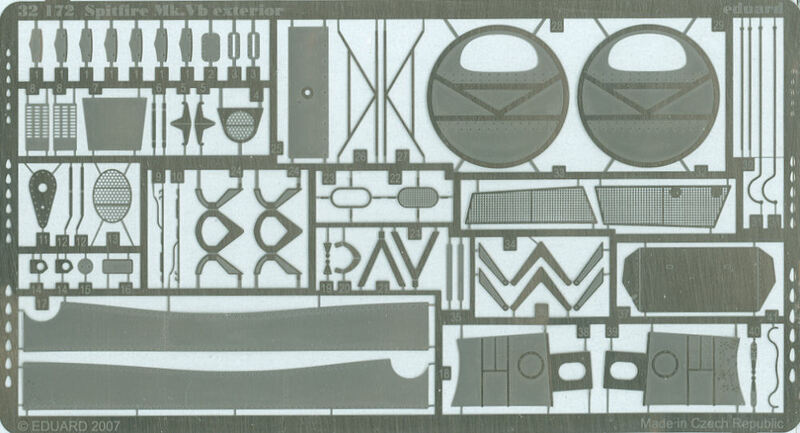 This set will really set off the Hasegawa Spitfire kit though this detail set is not for the beginning modeler. You will need to be able to remove the photo-etch parts from their frets (simple once you know how) and then be able to apply these details using cyano adhesives without gluing yourself to the kit parts. It isn't difficult, or else these sets wouldn't be so popular. You should be able to find this detail set at your local hobby retailer or one of the many online hobby shops. Trust me, this is worth looking for!